Over 100 more channels than the FAMILY? package, Save $26 a month until 2011. Reg. price: $55.99/month. 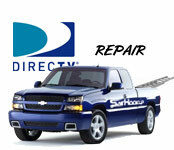 Get FAST Directv repair and installation from a local Directv Installation professional. Get Directv online through SatHookup and get an additional $5/mo. off your Direct TV service for 12 months for a total of $60 in savings over anyone else! Get Directv satellite tv service from SatHookup and you'll get one of the best television experiences available today. With the most HD channels available out of any tv prover, sleek and easy to use equipment, and home of the NFL Sunday ticket and NBA League Pass, Directv may be right for your home.